A Look at the Other Morocco: From Protests Against Austerity to Occupation of Western Sahara | Democracy Now! anthropologist and democracy activist based in the U.K. She’s a lecturer at the University of Westminster in London, and she is writing a book currently on the February 20 movement in Morocco. Late last month, thousands of people took to the streets of Marrakech, Morocco, to protest after a fish seller was crushed to death in a garbage truck trying to retrieve fish confiscated by police. Video circulating online appears to show Mouhcine Fikri jumping into the back of the truck to rescue his swordfish, before being crushed to death by its compactor. The protests in Morocco were called by activists from the February 20 movement, which organized demonstrations during the Arab unrest of 2011. Fikri’s death drew parallels to that of Tunisian fruit seller Mohamed Bouazizi in 2010, whose death sparked the Arab Spring uprisings. We speak with Miriyam Aouragh, a Dutch-Moroccan anthropologist and democracy activist based in Britain and lecturer at the University of Westminster in London. AMY GOODMAN: We’re broadcasting from Marrakech, Morocco, the site of the U.N. climate talks, known as COP 22, of the Conference of Parties. Security is heavy today as the high-level talks have just begun. Earlier in the broadcast, you might have heard the crowd when King Mohammed of Morocco walked by. His family has been ruling Morocco since the 17th century. Late last month, thousands of people took to the streets to protest after a fish seller was crushed to death in a garbage truck trying to retrieve fish confiscated by the police. Video circulating online appears to show Mouhcine Fikri jumping into the back of the garbage truck to rescue his swordfish, before being crushed to death by its compactor. The protests were called by activists from the February 20th movement, which organized demonstrations during the Arab Spring of 2011. Fikri’s death drew parallels to that of Tunisian fruit seller Mohamed Bouazizi in 2010, whose death sparked the Arab Spring uprisings of Tunisia and Egypt. I recently spoke with Miriyam Aouragh, a Dutch-Moroccan anthropologist and democracy activist who’s now in Britain. She’s a lecturer at the University of Westminster in London, and she’s writing a book on the February 20th movement in Morocco. She came through New York when we spoke, and I asked her to talk about the significance of the climate talks being held here in Marrakech, Morocco. MIRIYAM AOURAGH: I think Marrakech is being chosen—this is the second or third major conference that is organized in Marrakech—because of its historic legacy. And it’s beautiful. It has an old city, Jemaa el-Fnaa. So I think, somehow, there is a kind of attempt to also use these conferences, with all due respect to the organizers and people who are genuinely interested, as also a way to promote tourism. So, Marrakech is also the site of these conferences to sort of put Morocco in the picture again for tourists. But also, on the other hand, it’s a bit remote from the sort of troublesome areas in the north. So I think they are also expecting that the kind of tension that is very, very prevalent in the north, like Tangier and Al Hoceima, or the political presence of political parties and movements in Rabat will be absent in Marrakech. So that is the reason, I think, they choose Marrakech. AMY GOODMAN: The issue of press freedom in Morocco—Morocco ranks 131st out of 180 nations for press freedom, according to Reporters Without Borders. MIRIYAM AOURAGH: Yes. Morocco is very, very interesting in terms of press freedom, because the quantity of outlets has been confused for the democratic value of it. So what we’ve seen with the new king in the late 1990s taking over from a very archaic, oppressive king, Hassan II, is that it opened up the media. And it was one of the first countries, actually, that allowed privatized media. But what you see is 20, 25 different newspapers and outlets basically saying the same and reporting on the king’s visits to other countries. And so, the press freedom itself has actually, paradoxically, after the referendum of 2011 and the changing of the constitution, which promised more press freedom, has actually seen a regression. We’ve seen a regression of press freedom with arrests of famous journalists, like Ali Anouzla, and people who just left the country, editors of TelQuel, who are now in the United States. We see a regression of press freedom after, paradoxically, the change of the constitution that promised an improvement. So I think it’s another—it’s another symptom of showing how contradicting the situation at the present is. AMY GOODMAN: What can’t reporters report on? MIRIYAM AOURAGH: I think there are like several red lines that everybody who knows a bit of Morocco knows, and so religion and obviously the monarchy, which also you see in a lot of the chants of the activists, who are very, very smart about maneuvering around possibilities for them to be scapegoated by also changing the chants from—instead of “The people demand the downfall of the king,” they would chant, “The people demand the downfall of the corrupt.” So, the kingdom and the Sahara. The Western Sahara is another red line that you can’t cross. AMY GOODMAN: And why don’t you explain what’s happening in the Western Sahara. MIRIYAM AOURAGH: Well, I mean, it’s a de facto occupation of another territory. It’s very complicated historically because of the Spanish colonial occupation and the way it also—like, unfortunately, a lot of experiences across the world, where colonizers would like exchange or deal with land and people as if they were consumer products. And so, this has been a lasting conflict, where there is a violent presence of the Moroccan army in the Sahara and that people are basically still living in a refugee camp. I always compare it to the Palestinian refugee crisis. And so, this is happening in the backyard, and people don’t talk about it. And there’s no international campaign to really successfully resolve the issue, because the international partners and supporters and allies of Morocco, such as the United States of America, are supporting the Morocco state in its position vis-à-vis the Western Sahara. And so, the Western Sahara is sort of treated as a holy issue that you should not touch. And if you do, then you’re unpatriotic and an infiltrant of the Algerian government, as they often use against activists. AMY GOODMAN: —for the Clinton Global Initiative in 2015 from the king of Morocco, on the condition she speak at an event in Marrakech. Well, in the end, that looked very awkward for Hillary Clinton, who was about to announce for president, so the former president, Bill Clinton, and their daughter, Chelsea Clinton, ultimately spoke in Hillary Clinton’s place. The donation, of course, coming as Hillary Clinton was about to announce for president. AMY GOODMAN: The significance of this? Did that surprise you? MIRIYAM AOURAGH: It didn’t really surprise me, because there has been very good relations between the kingdom of Morocco and American leaders historically. Hassan II was known to be good friends with Ronald Reagan. And the new king, Mohammed VI, from quite early on, had actually private friendship relations with the Clintons. So this is actually a continuation of an organic relation. But I think what is maybe slightly—not shocking, but, I think, hurting, is that this revelation, it’s adding insult to injury. It’s adding insult to injury in the sense of this is a country where its people are, you know, being killed for selling fish, where this is a country where, by the way, we have already seen at least 10 Mohamed Bouazizi cases. People have committed suicide, put—set themselves on fire. Before the murder of Mouhcine Fikri, we’ve seen this, year after year, these cases. So this is a desperate country where the divide between rich and poor is incredible. It’s undescribable. And then, in this context, the king just throws away $12 million, which could have, you know, built a wing in a hospital or given free education. So I think the symbolic level of it is probably also what is in the mind of the people who are protesting now on the street. AMY GOODMAN: You mentioned water privatization. What are the companies, and where is it happening? MIRIYAM AOURAGH: So, the Tangier, a big city in the north, which has undergone extreme development, as I’ve seen it, following the last three years, particularly during field work in Tangier. We’ve seen, I think, transformations that are unprecedented. The pace of the changes are unprecedented. And so, the sort infrastructural changes and the aims of Morocco to become the biggest port of Africa and a new port in Tangier, which, I mean, of course, leads to terrible situations, like people being kicked out of their houses, etc. But it sort of accommodates also a new privatized approach to policy. One of that is water. And water is very, very important for people, and to have accessible, affordable water. So that has been privatized under the name—a company of the name Amendis, which is also mostly owned by France, and which is another painful reminder of the continuation of the colonial dependency. And so, in the last two years, there has been a lot of unrest. And last year there were major protests in Tangier, in particular, where people went on strike. They went on strike, and they would—for instance, the electricity part of Amendis had led to people turning off their lights and lighting on candles, and also just pickets and sit-ins and protests outside Amendis offices. And I think the state was quite surprised and a bit afraid by the level of anger. So I think, for me, it also shows that when issues have to do with very direct, everyday life, social, economic matters, people are really willing to go out on the street in large numbers, in ways that are much more difficult to mobilize around a bit more abstract issues, such as democracy and freedom of speech. And I think this will continue. AMY GOODMAN: Can you draw the parallels between what happened to Mouhcine Fikri—do you think there’s a parallel—in the northern town of Al Hoceima, apparently authorities ordering, or actually hitting the button themselves, his death, by crushing him in the garbage truck as he tried to get out, and what happened to Mohamed Bouazizi in Tunisia in 2011, when authorities stole his scale? He got so frustrated he set himself on fire, and that sparked the Tunisian revolution. AMY GOODMAN: “Grind the mother”? MIRIYAM AOURAGH: —is an abbreviation of another swear word. So, in this sense, “grind the mother.” And it’s also a very, very important signal that in these places in the north, the Amazigh people, like Fikri, the police are not local, so they are Arab-speaking police officers who use these Arab swear words. And so, the parallels are there in the sense of like they have no value, they have no dignity, they can be crushed at will. But I think what Fikri shows a bit more is the sort of larger neoliberal effects of the privatization of the fisher industry. I mean, the Moroccans have the most beautiful coast and beaches and the best fish you can imagine around the continent, but they don’t own it. So, the Moroccans have sold off their fisher industry for almost nothing to European multinationals. And so, what used to be also a source of living for people has been taken away, not just by the state, but by selling it off to the previous colonizers. AMY GOODMAN: Why isn’t he allowed to get swordfish at this time of year? MIRIYAM AOURAGH: I think that is—honestly, I think we need to be careful about just adopting that argument. I don’t believe it. I think it’s a way of sort of depoliticizing the events. I don’t think the Moroccan state has any respect for seasonal fishery or not. The way they organize construction and vegetation and fishery has no relevance to what is good or not good for the fisher. I think they were just using that as an excuse this time to frame it as a criminal act, rather as a sort of poor act of an informal seller. So I don’t think the argument of this is not allowed in this season is very relevant in this case. AMY GOODMAN: Talk about what happened in Morocco in 2011, as opposed to what happened in Tunisia and Egypt. What was similar? What was different? MIRIYAM AOURAGH: Yeah, yeah, so I think what we saw in Morocco was quite extraordinary. I think, also because a lot of people don’t really know about Morocco and that really the focus on the political developments in the region are more on like Egypt and other countries that have to do with international politics, like Syria and Palestine, so it was a bit of a surprise. But it was also a bit of a surprise for the people themselves. I think it was a rediscovery of their agency, the fact that Morocco saw mass protests in 2011 across the country, which is also, I think, slightly different from what we’ve seen elsewhere, where often protests would concentrate on capital cities. What you saw in Morocco is kind of typical to the Moroccan system or way of living that is a bit more anarchic. Like you saw it spread all over. And this we see again now. We see that it started in Al Hoceima and the villages around Al Hoceima and Imzouren, where Fikri is actually from, spread across the country in less than 12 hours. So I think the diversity and the way it spread across the country is quite unique, and it makes it very hard for the government to control it. I think that’s one important factor of difference. And the other thing that you saw—and I think that’s also what I was trying to find out in my research: Did the movement disappear? Did it decline after 2011? Yeah, we talk about it now as if the revolutions failed. AMY GOODMAN: And the king did not fall. MIRIYAM AOURAGH: And the king did not fall. Actually, what you saw, it manifested itself in different ways. So, since 2011 until now, there has actually never been opposing protests. There have been protests every six months. So what you see is that the sort of democratic language of the 20 February movement—the people demand the fall of the corrupt regime—translated into concrete socioeconomic demands. And in these same places that these protests are occurring now, we have seen enormous strikes and protests by students, by school students, by citizens, striking against the privatization of water, of the French company Amendis. So there’s been—in every city, there’s been particular concrete struggles. And I think what we’ve seen now is that the tragic, tragic assassination of Mouhcine has provided a venue, a sort of breath, to bring all of that together and to maybe have act two of the Arab uprisings of 2011 in Morocco. That was act one, and this could be act two. AMY GOODMAN: The Dutch-Moroccan anthropologist Miriyam Aouragh. She is a lecturer at the University of Westminster in London, writing a book on the February 20th movement in Morocco. I spoke to her late last month in New York. 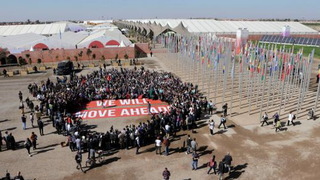 Here at the climate talks in Marrakech, Morocco, the word is that Morocco has attempted to silence voices from Western Sahara, which Morocco has occupied since 1975. Last week, Moroccan authorities barred Suelma Beirouk from attending the summit, even though she serves as the vice president of the Pan-African Parliament. She was reportedly held by Moroccan police for 75 hours without food or water. Morocco also faced criticism after it briefly published a map on an official COP 22 website that showed occupied Western Sahara to be a part of Morocco. The image was later taken down from that website. The U.N. considers Western Sahara to be a non-self-governing territory. In March, Morocco expelled U.N. staffers from Western Sahara after U.N. Secretary-General Ban Ki-moon referred to Morocco’s rule over the region as an “occupation” during a visit to refugee camps in the Algerian town of Tindouf, located in southwestern Algeria. That’s where Western Saharans are in those camps. Coming up, we speak to Nigerian environmental activist Nnimmo Bassey. Stay with us.